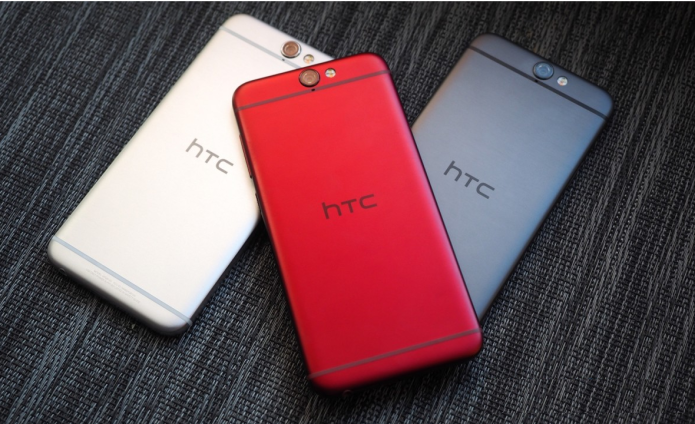 HTC has a new flagship, the One A9, and it’s going to be controversial. Hero device after the One M9 and M9+, it’s one of the first Android 6.0 Marshmallow phones outside of Google’s own Nexus, and with a highly competitive price tag that belies its build quality. That controversy? Just about everyone agrees, the One A9’s design is… familiar. Exactly what it’s familiar to depends on who you are, though. If you’re, well, anybody else, the new smartphone almost certainly reminds you of Apple’s iPhone 6s. The two aren’t identical, mind. The One A9 has a sharper transition between the front and back of the phone and its sides; that’s allowed HTC to use different finishes, with brushed metal on the back and bead-blasted polish on the edges. CNC milled, the ridged power button is easy to find with a fingertip underneath the volume keys, while on the opposite site there’s the SIM slot and the memory card slot. HTC has been refining its embedded antenna technology for several generations of device now, and the One A9 has the narrowest strips of plastic yet. Where the iPhone 6s has a crescent that runs up and around the camera – left-aligned on Apple’s phone, but dead-center on the HTC – the One A9 hides that portion more successfully, in a lozenge of plastic embedded into the top edge. I’m torn about the design. On the one hand, I can already hear the criticism from iPhone fans, and they’re not without some grounds. Leave an iPhone 6s on the table next to the One A9, and the similarities are glaring. On the flip side, this is one of the most cleanly designed and executed Android phones in recent memory. Not as big so as to be unwieldy, but still eminently usable. Premium feeling in the hand, clever in its detailing; it’s a genuinely appealing device. Looking past the design for the moment, on the front is a 5-inch AMOLED screen covered in 2.5D curved Gorilla Glass 4. It’s a Full HD panel, not QHD, but frankly that’s no significant compromise for a display of this size. The AMOLED blacks are pitch-deep and the colors pop. Underneath, there’s a multidirectional fingerprint scanner integrated into the home button, and on the bottom the 3.5mm headphone jack and a microUSB port. Why no USB-C? HTC tells me that’s a decision made between it and the carriers, which don’t see the new port gaining traction in accessories until midway through 2016. Perhaps that’s true, but it’s still annoying doing without a plug that works in either orientation. Inside, there’s a perhaps surprising choice of processor: Qualcomm’s Snapdragon 617 octacore. The absence of an 800-series chipset may prompt furrowed brows, but HTC says it’s a deliberate decision rather than just a cost-cutting compromise. The Snapdragon 617 is paired with 3GB of memory and 32GB of storage – in the US, at least; Europe will be offered a 2GB, 16GB version – and of course you still get a microSD card slot. The new aesthetic comes with some sacrifices if you’re an HTC fan of old. Gone are the BoomSound front-facing stereo speakers, replaced with a single speaker on the bottom edge. According to HTC, trying to fit stereo drivers would’ve forced the engineers to move the fingerprint sensor to the back of the phone, where it would’ve been less ergonomically placed and also make the One A9 thicker. However, if – like me – you listen to your music with headphones more often than out-loud from your phone, that experience should actually be improved. There’s Dolby Surround Sound and Dolby Noise Reduction, plus a dedicated amp for the headphone jack. The One A9 also supports 24-bit sound, and since native files of that bitrate are relatively rare, it can upsample too. On the front, there’s an UltraPixel sensor with f/2.0 optics for selfies, while on the back is a 13-megapixel camera with f/2.0 lens and, praise be, optical image stabilization (OIS). HTC was criticized for dropping the One M7’s OIS on the M8 and M9, and so I’m not going to be alone in welcoming it back with open arms. It’s been a few years of camera experimentation for HTC. First there was UltraPixel, emphasizing low-light performance but at the expense of resolution. The One M9 swung in the opposite direction, but its 20-megapixel sensor struggled more in low-light, and lacked OIS of course. The One A9 sits somewhere in-between. Picture resolution is sufficiently high that cropping out a section of interest doesn’t leave you with a comically low-res image, but the pixels are large enough that low-light performance should be credible. HTC is leaving nothing to chance, though, and so there’s both auto and pro modes, the latter spitting out RAW images for post-processing. Even if you just hit auto-enhance in the HTC Gallery, RAW shots should see an improvement, particularly those which were taken in low-light conditions. Zoe photos are supported – yes, HTC was combining stills and video before Apple did Live Photos – as are hyperlapse shots. Cleverly, HTC uses the gyroscope and accelerometer to better line-up each of the images in the latter, for smoother videos. The only things missing, really, are laser autofocus as LG has been using lately – and which HTC says was just too bulky to accommodate – and 4K video recording. Instead, the One A9 tops out at 1080p. The last big hardware surprise is the battery. The shock isn’t that it’s non-removable, which is to be expected from HTC these days, but instead its size: just 2,150 mAh. The One A9 does support Quick Charge 3.0, though, for much faster recharging with a higher-power AC adapter, and unlike previous Quick Charge enabled HTC phones there’ll actually be just such an adapter in the box. On paper, the One A9 should last for up to 12 hours of HD video playback, up to 9 hours of WiFi internet browsing, or up to 16 hours of 3G talktime. Over on the software side, HTC Sense is still evident in places, but Android 6.0 Marshmallow is left to show through far more than any earlier iteration of Google’s OS. There’s Android Pay, Now On Tap, and both Doze and App Standby. As Newby-House points out, Sense originally came about because Android itself wasn’t really market-ready. HTC filled in the gaps and what began as a skin and a few custom apps grew to the all-encompassing software experience familiar from the One M8 and M9. So, there’ll still be things like BlinkFeed, and HTC apps, but they won’t be tied so deeply into the phone’s kernel. Some optional software and widgets will be distributed through the Play store for HTC users, and the company will be able to update its own tweaked elements more easily, rather than having to wait for a more significant OS release. That should also mean faster Android updates. HTC currently aims for a 90 day window after Google releases the code for a new version, but the One A9’s more low-key modifications should see that time dwindle. As HTC has found to its cost, however, just because it makes a strong device, doesn’t mean sales are necessarily going to be equally strong. So, the One A9 is priced ambitiously too: when it hits shelves in the US in November it’ll have a sticker of $399.99 unlocked with 32GB of storage. That, it’s worth noting, is $50 less than the 32GB Moto X Pure Edition. HTC will offer it through its own webstore – preorders start today, for a device that’s SIM-unlocked and with an unlockable bootloader that doesn’t void the warranty in the process – but the carriers are getting in on the action, too. Initially Opal Silver and Carbon Gray will be the US color options, with a Deep Garnet red version and a Topaz Gold model down the line. Internationally, HTC has confirmed UK pricing will start at £429.99 for the 16GB model with 2GB of memory. There’s a whole lot to like about the HTC One A9, though plenty of lingering questions. Will the Snapdragon 617 processor prove a weak link, or will battery life end up undermining the whole experience? I’ll be answering those questions in our full review; until then, let me know what you think in the comments.